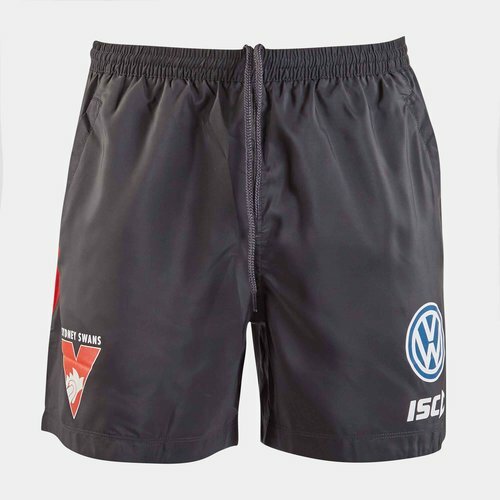 Show your pride in the Blood Stained Angels when you pull on these Sydney Swans 2019 AFL Players Training Shorts from ISC. The Sydney Swans are a professional Australian rules football club that plays in the Australian Football League (AFL). The team won premierships in 1909, 1918 and 1933 before experiencing a 72-year premiership drought—the longest in the competition's history. The club broke the drought in 2005 and won another premiership in 2012. The club has proven to be one of the most consistent teams in the nationalised AFL, failing to make the finals in only three seasons since 1995, playing the most number of finals matches and winning the second-most matches overall (only behind Geelong) since 2000 and boasting a finals winning record of over 50% in the same time period. These shorts are 100% polyester and come in black with red and white detailing similar to the home guernsey and is traditional for the club. The team badge is on the right leg and ISC logo can be found on the bottom left leg.